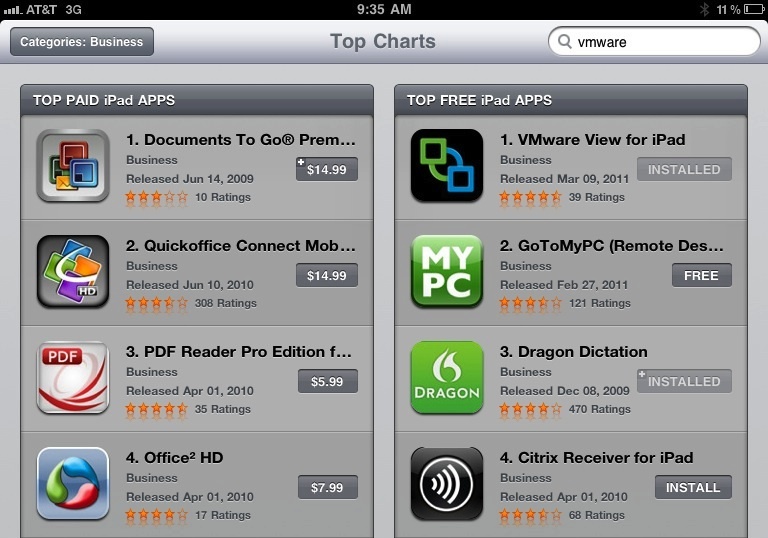 Today we launched the VMware View Client for iPad. I am excited to report that it is currently the number one free business App in the Apple iPad AppStore. Thank you to all of our VMware customers and enthusiasts who downloaded it right away! I also want to especially thank the VMware R&D and product management teams that made this release happen. It is an awesome client that was well worth the extra time you put in making sure we delivered the quality and usability our customers have come to expect from VMware. Just like I did with the release of View 4.5, I thought I would provide you some background on how this release came about. One may ask: why did you wait until the release of iPad 2 to deliver the View Client for iPad? iPads have been on the market for a while now and although our good partner Wyse has had a solution for our common customers for a year, View customers have been asking us to ship a PCoIP version of the client directly from VMware. Listening carefully to our customers and partners, we chose to do the foundational work to make this happen. Let’s break it down. At VMware we have been on a predictable release train across all our main products for a while now. That’s what enterprise customers want: predictability with high quality. This provides a cadence that gives enterprise IT teams enough time to adopt our products and give us the right amount of room to innovate. In the client space, while predictability and quality are paramount, the cadence of innovation driven by the consumerization of IT is even more rapid. Our View client and vSphere server releases were historically joined at the hip. With the launch of View 4.5 we decoupled the product release so that we can deliver innovation to the client outside of the server release cycle. There was another piece of the puzzle that we added so that we could give our VMware View customers the excellent experience they wanted when accessing their virtual desktop from mobile devices – the PCoIP Security gateway. This component of View allows users to connect to their virtual desktop from outside the firewall without requiring an SSL-VPN solution. In user-friendly terms, you enter your username and password and then you just “click-to-connect”. We shipped the PCoIP enable security gateway with View 4.6 which went out a couple of weeks ago. The actual View Client for iPad was already cooked and ready when we launched View 4.6. We just had to get it passed the Apple store police 🙂 which was a smooth process. So, today was the day. Customer feedback thus far has been fantastic. We hope you enjoy the VMware View Client for iPad experience as much as we do!! As exciting as this release is, this is just the beginning of course!!! We are already busy working on the next release, the next platform, the next cool tablet… stay tuned for more!!! And don’t forget to check out the official View Client for iPad blog post.